Since the development of acceptance and commitment therapy as a therapy model, there has been much debate about the similarities and differences between it and ‘second wave’ cognitive-behavioural practices (i.e. cognitive therapy, rational emotive behaviour therapy). This article builds on these discussions, discussing the underlying theoretical constructs relevant to the philosophy and practice of ACT and ‘second wave’ CBT models. Ultimately, this results in the conclusion that there are more similarities than differences between the two. Many of the espoused differences between them appear to be due to the implicit versus explicit attentional foci of the different models, and due to the development of idiosyncratic language by the different authors. As a result, it would appear that there is more to be gained by bringing these models together, to solidify the cognitive-behavioural framework and its application to therapy. James Collard declares that he has no conflict of interest. Arch, J. J., Eifert, G. H., Davies, C., Vilardaga, J. C. P., Rose, R. D., & Craske, M. G. (2012). Randomized clinical trial of cognitive behavioral therapy (CBT) versus acceptance and commitment therapy (ACT) for mixed anxiety disorders. J Consult Clin Psychol. https://doi.org/10.1037/a002831010.1037/a0028310.supp(Supplemental). Beck, A. T., & Bredemeier, K. (2016). A unified model of depression: integrating clinical, cognitive, biological, and evolutionary perspectives. Clin Psychol Sci, 2167702616628523. https://doi.org/10.1177/2167702616628523. Burklund, L. J., Creswell, J. D., Irwin, M. R., & Lieberman, M. D. (2014). The common and distinct neural bases of affect labeling and reappraisal in healthy adults. Front Psychol, 5. https://doi.org/10.3389/fpsyg.2014.00221. Ehlers, A., & Clark, D. M. (2000). A cognitive model of posttraumatic stress disorder. Behav Res Ther. https://doi.org/10.1016/S0005-7967(99)00123-0. Gross, J. (1998). The emerging field of emotion regulation: an integrative review. Rev Gen Psychol, 2. https://doi.org/10.1037/1089-2680.2.3.271. Hofmann, S. G., & Hayes, S. C. (2018). The future of intervention science: process-based therapy. Clin Psychol Sci, 2167702618772296. https://doi.org/10.1177/2167702618772296. Taylor, S., Coles, M. E., Abramowitz, J. S., Wu, K. D., Olatunji, B. O., Timpano, K. R., & Tolin, D. F. (2010). How are dysfunctional beliefs related to obsessive-compulsive symptoms. J Cogn Psychother. https://doi.org/10.1891/0889-8391.24.3.165. Vîslǎ, A., Flückiger, C., Grosse Holtforth, M., & David, D. (2016). Irrational beliefs and psychological distress: a meta-analysis. Psychotherapy and Psychosomatics. https://doi.org/10.1159/000441231. Zettle, R., & Hayes, S. (1982). 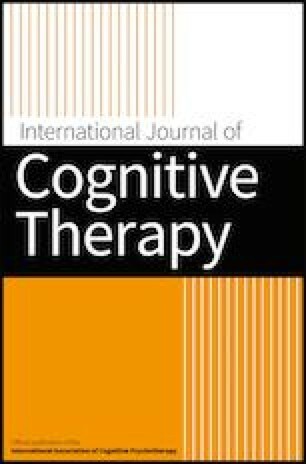 Rule-governed behavior: a potential theoretical framework for cognitive–behavioral therapy (Vol. 1). https://doi.org/10.1016/B978-0-12-010601-1.50008-5.